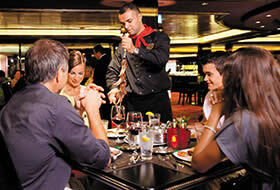 Why Cruise on Norwegian Cruise Line? It’s your vacation and you should have the freedom to enjoy it on your terms. Dress up or down. Sleep in or catch a sunrise from your own private balcony. Take in some never-before-seen entertainment at sea. Even eat somewhere different every day of the week. Freestyle Cruising offers a wide range of complimentary dining options included in your cruise price, and all available on your schedule. The freedom continues with entertainment for everybody. 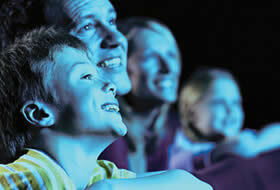 From Broadway shows, to adults-only clubs where you can dance ’til dawn, to supervised activities for kids and teens. Freestyle Dining No set dining times, no assigned tables, a relaxed dress code and more restaurants than days in the week on every ship, so you can enjoy whatever you’re hungry for, whenever you’re hungry. Freestyle Fun & Entertainment How do you have a good time? Pools with slides, Wii” on two-story screens, modern fitness centers, expansive spas, fun kids and teens programs, wine tastings, an always-exciting casino and more are all waiting for you on board. Freestyle Accommodations Retreat to accommodations designed for the way you cruise, from The Studios – staterooms for the solo traveler – to spacious 2-Bedroom Family Suites. Want an oceanview? 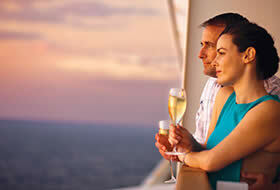 We offer a higher percentage of balcony staterooms than any other cruise line.